In some earlier posts, I wrote about the variation across states and industries in terms of productivity at a particular point in time. I like to think about these measures as gauges of what I call economic condition. Another way to look at things is to examine changes in productivity over time. These types of changes I refer to as a gauge of economic performance. GDP by industry is a good proxy for productivity since it’s defined as gross output minus the cost of goods sold. I was hoping that this exercise would not simply become a Rorschach test, but looking at the map was indeed interesting. You can see some patterns and commonalities, but also some odd occurrences. It represents a conundrum that some of the more revered hitters in baseball history have observed in trying to explain baseball. As Willie Stargell observed, “they give you a round bat and they throw you a round ball and they tell you to hit it square.” Indeed, hitting things squarely is the challenge for manufacturers. So, how are states doing in terms of hitting the ball squarely when it comes to manufacturing productivity growth? To that end, I downloaded real (inflation adjusted) Manufacturing GDP by state in 2009 and 2016 from the U.S. Bureau of Economic Analysis. I wanted to see how states were performing when you look at the change in Manufacturing GDP over time since the great recession. I was surprised at what I found. The differences across the 50 states was quite startling. The good news, on the one hand, was that 36 states saw real manufacturing GDP grow between 2009 and 2016. The bad news, on the other hand, is that real manufacturing GDP fell in 14 states over the same period. I divided the states into 4 groups. Group 1 was made up of a handful of states that saw real manufacturing GDP grow by more than 20% between 2009 and 2016. These states were concentrated along the northern tier of the Canadian border. I like to think of it as the “you betcha corridor.” Another cluster is along a corridor from Michigan down into Alabama along with South Carolina. These states I relate to as the auto belt along with the associated supply chain. I suspect the robust changes in GDP in these states reflects the fact that they took a significant hit during the great recession. Some other states such as Montana, Wyoming, and Texas are in the group and this may likely reflect changes in the oil industry, but it is odd that other states also dependent on oil and gas did not move along a similar path. More on that later. Group 2 grew by more than 10% but less than 20%, which included a few states in New England – New Hampshire, Massachusetts, and Rhode Island. These three stand in contrast to what happened in other states in the Northeast. California, Idaho, Arizona, and Hawaii were states in the west that fell into this group. Also included were some states in the plains and Midwest, including Kansas, Iowa, Missouri, and Wisconsin. I consider some of these states as agriculture and farm equipment meccas. Florida, Mississippi, and Arkansas were the southeast states in this group. Group 3 grew more slowly – by less than 10%. This group was scattered across the map, although you can see a cluster of states in the west – Washington, Oregon, and Nevada. Other states including Colorado, Nebraska, Louisiana, Illinois, Georgia, and Pennsylvania fell into this group as well. They seem to be more outliers in terms of their nearby states. Group 4 experienced a decline in real manufacturing GDP change over the 2009 to 2016 period. This is an interesting set of states. First, you see a concentration of these states along the east coast starting in North Carolina and going all the way up through Maine. Out west, you see a handful of states including Alaska, Oklahoma, New Mexico, and Utah also in this group. 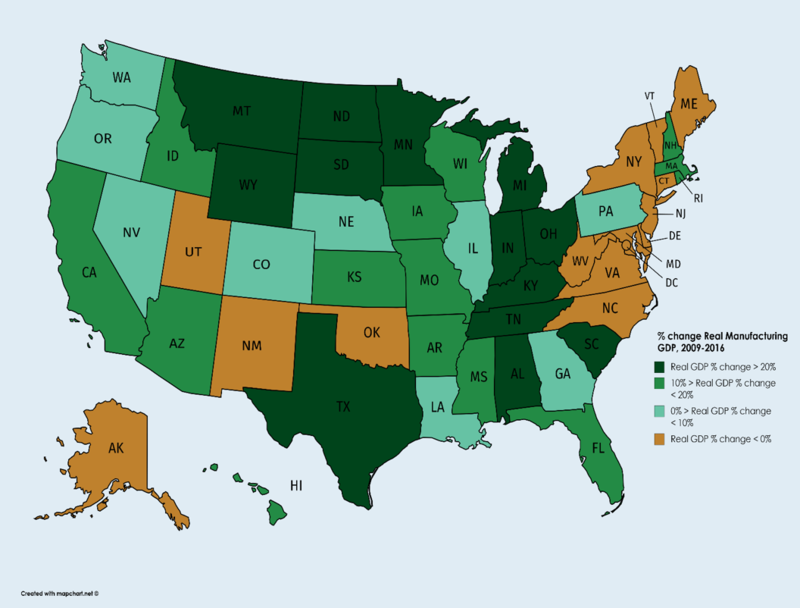 Alaska, Oklahoma, West Virginia, and New Mexico to a lesser extent are more resource dependent manufacturing sectors, but their experience stands in stark contrast to what happened in Wyoming, Montana, and Texas, so this seems anomalous. Productivity is an important measure, as I have argued in previous blogs. Think of these various postings as a mosaic that sheds light on different dimensions of productivity and manufacturing. The 2017 American Innovation and Competitiveness Act (AICA) that re-authorized the operation of the Hollings Manufacturing Extension Partnership (MEP) Program makes it quite clear. The AICA states that the Program’s objective is to enhance the competitiveness, productivity, and technological performance of U.S. manufacturing. While it’s hard to imagine that MEP can improve overall manufacturing productivity and growth, it is important to keep this notion in mind as we do our daily work. As I argued a few years back, improving productivity is not an accidental activity, but something that must be planned. Productivity results from a commitment to operational excellence, a well-thought-out plan, and its effective deployment. This requires working on multiple fronts including reducing costs, growing the top line, adopting new technologies, and working smarter. As Tommy Lasorda once observed, there are three types of baseball players: those who make it happen, those who watch it happen, and those who wonder what happened. I hope more manufacturers (and MEP Centers for that matter) are in the first group – those making it happen by improving their performance over time – rather than the latter group, who ask what just happened. There are no silver bullets, but there are several things manufacturers and Centers can do. Looking at manufacturing productivity growth by state is a good start.